The 1999 Pan Pacific Swimming Championships were held in August at Sydney Olympic Park, and were viewed as a rehearsal for the 2000 Summer Olympics to be held in the same venue. With Thorpe expected to deliver world records at his first international meet in Sydney, the event was shown live on Australian television for the first time. The opening night saw him pitted against Hackett and South Africa's Ryk Neethling in the 400 m freestyle final. The trio reached the 200 m mark in a group, on world record pace, before Thorpe broke away, recording a split time 1.86 s ahead of world-record pace at 300 m. He extended his lead to four body lengths by the 350 m mark and finished in a time of 3 min 41.83 s, cutting almost two seconds from the world record, and covering the second half in almost the same time as the first. Talbot reacted to the performance by dubbing Thorpe as "the greatest swimmer we've [Australia] ever had", whilst four-time American Olympic gold medalist Rowdy Gaines, commentating for NBC, said "...he went into a balls-out sprint at 250 – and I have never seen anything like that...I have been around swimming a long time and it's the most amazing swim I've ever seen, hands down." A formula used by the International Swimming Statisticians Association to compare world records in different events gave his performance the highest score of all current world records. 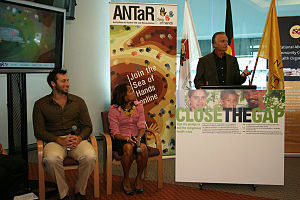 Thorpe promptly donated the A$25,000 prizemoney for breaking the first world record in the pool to charity. Later the same night, Thorpe anchored the Australians to a historic victory in the 4 × 100 m freestyle final, the first time the United States had lost the event. Thorpe set an Australian record relay split of 48.55 s. Even taking into account a 0.6–0.7 s for a flying relay start, his split time was almost 1 s faster than his individual best of 49.98 s. It was to be the first of many occasions in which he would anchor the Australian relay teams to victory over the Americans, with splits consistently faster than his equivalent individual times. The following night, in the semi-finals of the 200 m freestyle, Thorpe broke Hackett's world record by 0.33 s, clocking 1 min 46.34 s. The next day in the final, he again broke the record, lowering it to 1 min 46.0 s. He finished his competition by leading off the 4 × 200 m freestyle team with Klim, Hackett and Bill Kirby to victory. Their time lowered their own world record by more than three seconds, completing Thorpe's fourth world record in four nights. Immediately after the Pan Pacific Championships, Thorpe's management announced his signing to Adidas for an undisclosed six-figure sum, stating that he would race in their new bodysuit. This presented a dilemma, as the national team was sponsored and wore outfits designed by Speedo, leading to months of protracted discussions and uncertainty. 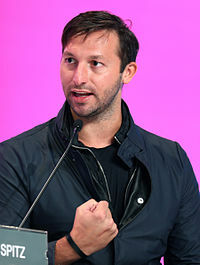 To compound his commercial difficulties, Thorpe had an uncertain end to the sporting year when, in October, he broke a bone in his ankle whilst jogging. However his performance throughout the year was recognised when he was again named as the World Swimmer of the Year by Swimming World, and by Swimming Australia as its Swimmer of the Year. In a wider arena, he was named Young Australian of the Year, ABC Sports Star of the Year, and Male Athlete of the Year at the Australian Sports Awards. Thorpe arrived for the 2003 World Championships in Barcelona for his first major international competition since Menzies' appointment under heavy media scrutiny following his non-improvement at the Australian Championships. On the first night of competition Thorpe defeated Hackett in the 400 m freestyle in a time 2.5 s outside his world record, making him the first to win three world titles in the same event. After his relatively slow 400 m, he was again under pressure in the 200 m freestyle after van den Hoogenband led at the 100 m mark ahead of world record pace. Thorpe managed to respond and retain his world title, and gained some relief after his sprint training yielded his first medal in the 100 m freestyle at a global competition; he finished third in 48.77 s. In all three freestyle events however, he had swum slower than his times under Frost. He ended his individual campaign on a promising note with his experiment with the 200 m individual medley, setting a new personal best of 1 min 59.66 s to claim silver. Thorpe again anchored the 4 × 200 m freestyle team to retain the world title along with Hackett, Nicholas Sprenger and Craig Stevens, with a reduced margin over the Americans, who finished less than two seconds in arrears. Michael Klim's injuries left the relay teams weakened, with Thorpe anchoring the 4 × 100 m freestyle team to fourth, At the end of a difficult year in the water, his standing had fallen in the eyes of Swimming World, who rated him fourth in the world. He was again named as Australian Swimmer of the Year, jointly with Hackett. After his feats at the 2003 World Championships, Speedo had generated significant media publicity by offering Michael Phelps US$1 million if he could match Spitz's seven golds. Thorpe was adamant that this was impossible, and scrapped his seventh event, the 200 m individual medley from his Olympic program. In late March 2004 at the Australian Championships in Sydney, Thorpe overbalanced whilst on the blocks in the heats of the 400 m freestyle and fell into the water, resulting in his disqualification and ending the defence of his Olympic 400 m title. This resulted in a large debate among the swimming and public community as to whether Thorpe should be given an exception to Australia's policy of selecting the first and second place getters, with Prime Minister of Australia John Howard describing the situation as a "tragedy". Despite the intense media spotlight, Thorpe managed to win the 100 m and 200 m freestyle events to ensure his selection for Athens. Craig Stevens, who had claimed the second qualifying position in the 400 m event, subsequently faced immense public pressure to relinquish his position to Thorpe, and later did so in a television interview for which he was paid. This generated ethical debate as to whether Stevens' decision had been bought, and criticism against Thorpe. Thorpe's Aquatic Center in Australia. Following his retirement, head coach of the US men's swimming team Bob Bowman—who also mentors Michael Phelps—called Thorpe "the greatest middle-distance swimmer of all time and...the greatest relay swimmer I have seen". Bowman further cited Thorpe's ability to raise the profile and popularity of swimming, noting that Phelps' public image was modelled on that of the Australian. Australian Olympic Committee President John Coates stated that "In 50 years from now Australians will still marvel at the feats of Ian Thorpe". Dawn Fraser, the first of only two swimmers to win the same Olympic event three times, said that Thorpe was the "greatest [freestyle] swimmer in the world", and lamented that he would not be attempting a hat-trick of 400 m titles. 2001: Awarded Medal of the Order of Australia (OAM) for service to sport as a gold medallist at the Sydney 2000 Olympic Games. 2007: Ian Thorpe Aquatic and Fitness Centre in Ultimo, Sydney named in his honour. 2012: Awarded Human Rights Medal for his charity work with Indigenous children. 2013: Conferred an honorary Doctor of Letters by the University of Western Sydney for his support for health and education services for Indigenous youth. 2014: Conferred an honorary Doctor of Letters by the Macquarie University in recognition of his extraordinary contribution for the sport, philanthropy and Indigenous rights. 2019: Advanced to Member of the Order of Australia (AM) in recognition of his "significant service to youth and Indigenous education through charitable initiatives, and to swimming." Thorpe is widely popular in Asia, particularly Japan. In 2000, TV Asahi identified him as the swimmer likely to be the most successful at the 2001 World Championships in Fukuoka, so they selected him as the event's marketing figurehead. In the lead-up, Thorpe visited Japan to promote Asahi in a series of television events, and upon returning for the competition, he was mobbed at the airport by youthful crowds 25 m deep; hundreds camped outside the Australian team's hotel. He was also praised by older sections of Japanese society as a role model for youth, due to what they interpreted as his humility and work ethic. It was estimated that more than 80% of the Japanese public watched his races on television. In 2002, in the wake of a tourism slump after 11 September terrorist attacks, Thorpe agreed to be an ambassador for the Australian Tourism Commission in Japan. The high-profile campaign included a meeting with the Japanese Prime Minister Junichiro Koizumi. The marketing drive resulted in an upturn in Japanese tourism to Australia, which was credited to Thorpe. In 2005, Yakult released a 'Thorpedo' energy drink—which featured a picture of the swimmer on the bottle—in Japan. This was part of an equity deal with the So Natural food group, in which Thorpe was given a 5% stake in the company—at the time worth A$1.1 m—in return for the use of his name and image on their products. The 15-year deal covers East and Southeast Asia and Thorpe's share in the venture could increase to 50% depending on its success. ^ "I'll never swim again, says Ian Thorpe". The Australian. 19 March 2016. ^ Dusevic, Tom (18 September 2000). "The Stuff of Heroes". Time. Retrieved 3 May 2010. Wikimedia Commons has media related to Ian Thorpe.